Thyroid gland is situated in the neck and produces a hormone called thyroxine, which helps in regulating body metabolism. While deficiency of thyroxine hormone causes Myxoedema in adults and cretinism in children, excess of thyroxine levels could lead to exophthalmic goitre, Graves disease or Thyrotoxicosis. Hyperthyroidism or thyrotoxicosis is a condition which is more common in women of age group 30 to 50 years. Such individuals show symptoms of irritation, over-anxiety, rapid heart rate, deep shallow respiration, diarrhea, heat intolerance, flushing, menstrual disturbance, fatigue and bulging of eyes. Though all of the said thyroid symptoms may not be present a few of such symptoms could be due to hyperthyroidism. 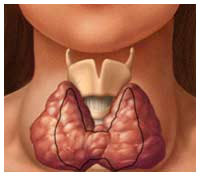 Hypothyroidism is a condition caused due to inactivity of thyroxine. This condition can be caused due to deficiency of iodine or thyroid failure or pituitary dysfunction. Symptoms include fatigue, loss of vitality and overall hormonal imbalance. When hypothyroidism is left untreated for a long time it could result in myxodema which is distinguished by swollen skin and tissues. According to Ayurveda, taking adequate quantities of milk can help in preventing goitre. Also rice, barley, Bengal gram, moong dal and cucumber are recommended for patients suffering from goitre. They should of course avoid heavy and sour foods. Herbs that are found useful in treatment of thyroid disorders include Kanchanara, Jatamansi, Shilajita, Brahmi guggulu, gokshura, and punarnava. As a home remedy, a fine paste of vegetable jalakumbhi can be applied over the affected area and the juice of jalakumbi can be given a few times in a day. This has a high content of iodine, the deficiency of which causes goitre. Coconut oil which contains medium chain fatty acids which help in improving body metabolism, is good for those suffering from thyroid disorders. The medicines used in Ayurveda for treating thyroid disorders include Kanchanar Guggulu, Ashwagandharishta, Amritadhaya taila and Mahayogaraj guggulu. Apart from all this, yogic asanas like Sarvangasana, Halasana, Suryanamaskara, Suptavajrasana are found helpful, though Pranayama is the most effective for curing thyroid problems.